InfoComm 2013 took the crown as the largest InfoComm show ever with 35,126 attendees from more than 110 countries, a new all-time record. 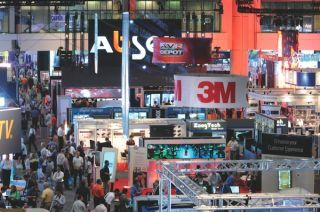 This represents a 2.5 percent increase in attendance over InfoComm 2012. The previous attendance record was 34,600 set in 2008. As InfoComm winds down, the association and exhibitors are already looking to next year’s show, returning to Las Vegas, where space is already being booked. Labuskes and the rest of the InfoComm team use the current show’s momentum to launch right into planning for the next show. “Part of the success of InfoComm is every year we examine what needs aren’t being met (and ask), ‘How do we leverage these demands to reach out further?’” Labuskes adds. “We are very excited about rebooking for 2014,” said Labuskes. InfoComm is also looking ahead to the AV Executive Conference, September 10 to 12, in Amelia Island, FL.